Past meeting program information is listed below. A select number of yukata cotton as well as copies of Patricia’s book will be on sale. Based in Denver, CO., Jennifer Rapacki is a tech-savvy fabric artisan specializing in combining traditional quilting techniques with technology driven designs and inkjet printing on fabric. For this lecture we will travel back in time to see examples of quilt patterns going back to the 11th century. Flying Geese, Sawtooth, Birds in the air are just a few of today’s quilt blocks that can be seen in ancient mosaics and architecture. Rachel Clark is an active PVQA member, fabric artist, teacher and lecturer who inherited a love of sewing from her great-grandmother. She has been designing wearable art since 1973 and teaching her unique and classy style characterized by eclectic fabric mixes, vibrant colors and stunning design since 1990. Rachel also has a keen sense of humor which is often reflected in her designs. Whether her wearable art is whimsical or elegant or reflects her personal or political attitudes, it is always exceptionally well crafted; some designers focus on design and technical expertise can fall short, but Rachel is a seamstress par excellance in addition to being a gifted colorist and designer. She will be sharing stories and tales as well as recent garment creations and older favorites during her talk. PVQA will honor one of our own members in August when Nicole Pullman will bring her exquisite quilts to the Monday, August 13 meeting. Nicole has been quilting for 14 years and has been a member of PVQA for 3 years. 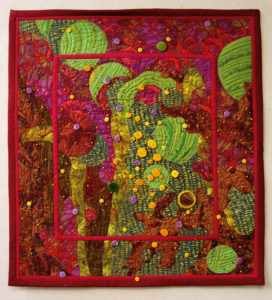 Her quilts reflect her love of nature and her skills with a variety of techniques including hand and machine quilting and applique. She likes to combine a variety of techniques in each quilt and explore original designs. 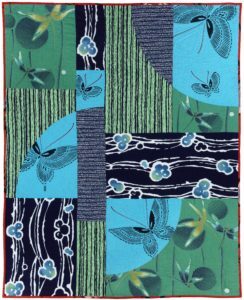 Carol Ziogas, Sashiko and Boro teacher and owner of the Asian textiles shop Kimonomomo will be the featured lecturer for the July meeting. 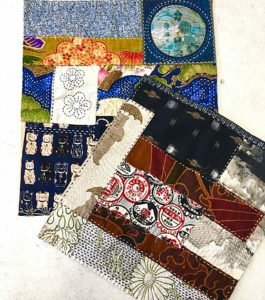 She has been researching Japanese textiles since 2004 and is a frequent traveler to Japan, where she blogs about visits to quilt shows, to artisans and their workshops and off-the-beaten-track fabric and textile stores. 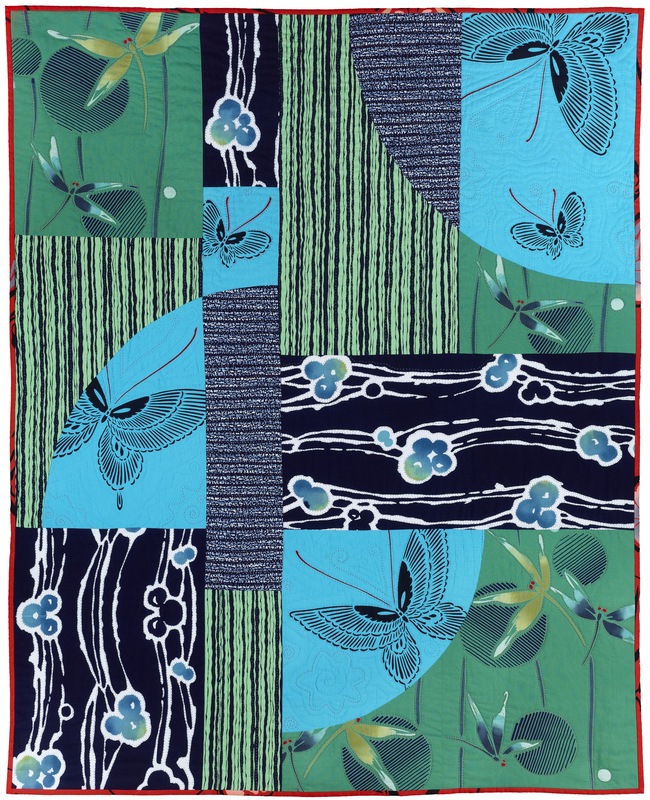 She has taught sashiko at the prestigious Tokyo International Great Quilt Festival. Carol will be bringing a ‘pop-up’ shop of special fabrics and tools, so be sure to allow extra time to enjoy her wares before and after the meeting. 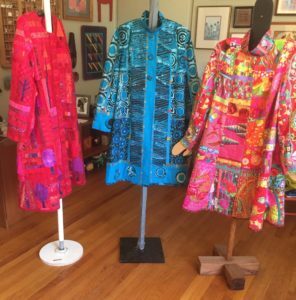 Known for her fearless use of color and her artistic flair, Freddy Moran is a local treasure, a popular teacher, an award winning artist and an inspiration to many quilters. 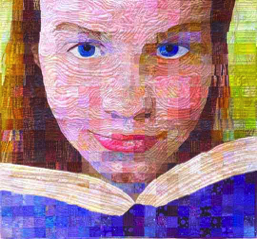 Her quilts reflect her joy in life and her ability to find inspiration wherever she goes. She’s well known for her long-time collaboration with Gwen Marston, her many books and delightful workshop. 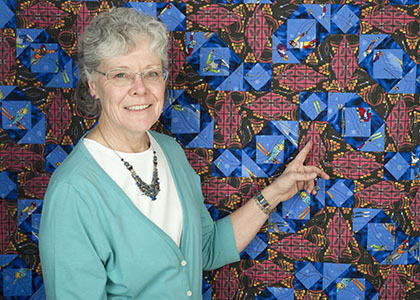 Freddy will lecture on her life as a quilter and display her colorful and uniquely beautiful quilts. 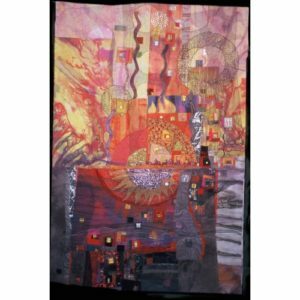 Rosalie Dace is a full time artist from Durban, South Africa, whose medium is quilt making. 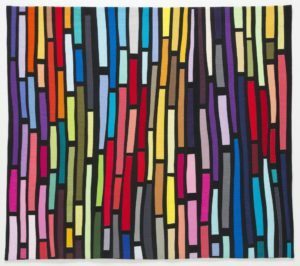 Her work reflects her passion for color, pattern and texture. She has had a lifelong interest in textiles and embroidery and has a degree in Art and English. While she values the traditions from which our quilt making has come, she believes that a quilt should say something about its time and place in history. This and her awareness of being a South African artist give her work its particular character. 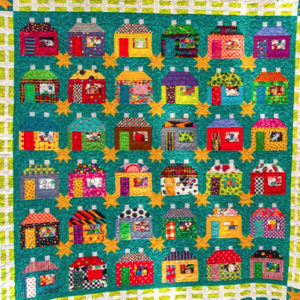 Ms. Dace’s work has been exhibited throughout the world, including at the Houston International Quilt Festival. She is a national quilt judge. Her work has won numerous awards, may be found in several private collections and has appeared in national and international publications. Rosalie will speaking about her life and work. Quilt Artist Maria Shell will share her work from her first stitches to her most recent pieces along with some fun stories about trying to quilt while raising three boys in the wild lands of Alaska. Maria’s work is grounded in the tradition of American patchwork while also connecting to both the modern and art quilt movements. It is a journey filled with laughter, dark Alaskan nights, and lots of stitching. Thom states: The content of my talk is concerning a new delight I’ve found in using the fussy cut leftovers for construction of what I call Scrappy Improv quilts. Using Freddie Moran’s technique of gluing everything with the Elmers Purple Glue-sticks prior to stitching, I’ve done some small quilts using just scraps, most of them in the shape I find them in from the scrap bags. I come from a background of working with expensive sheets of stained glass where I’ve cut carefully to have as large pieces left over as I can manage and still get exactly what I want from the piece I have. Since then, I’ve saved all the bits and pieces of fabric big enough to work with for years and only now have begun to explore what to do with them. 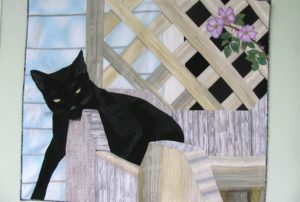 Sandra Bruce is an award winning art quilter with a background in illustration and lettering. An overview of the evolution of Material Matrix and how it works, along with Sandra’s colorful visual journey that brought her to this technique. by peoples from Africa and Asia have all influenced my work, in ways I’m still trying to understand. If you look at your quilts with an anthropologist’s eye, they’ll never look the same. 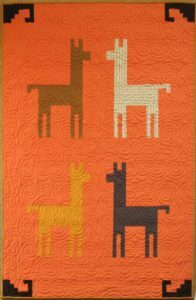 Pam Rocco is a member of the Pajaro Valley Quilt Association and the South Bay Area Modern Quilt Guild. 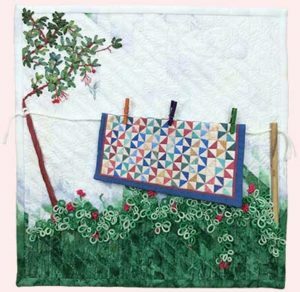 A regular columnist for many years in Quilters’ Newsletter Magazine and a popular quilt instructor, Pam Rocco learned how to quilt in Jackson, Kentucky, as a Teacher Corps intern in the ’60s. She’s always loved the fabrics and quilting styles of indigenous peoples (broadly, that includes the people of Jackson) and often incorporates them in her quilts. She mixes them up with fabrics from every time and place, and somehow it all seems to work. Based in Ventura, CA, Jennifer Rapacki is a tech-savvy fabric artisan specializing in combining traditional quilting techniques with technology driven designs and inkjet printing on fabric. In the lecture Jennifer shares her experiences and designs using Adobe Photoshop Elements, Frax HD, (a fractal app for the iPad), and Electric Quilt along with inkjet printing on fabric. Many samples of quilts will be shown along with a few quilts created with more traditional techniques. Nancy will share her insights on her own design process in a trunk show that features some of her award winning quilts, a selection of quilts from her six books, and quilts made with fabrics from her own collections. Please join us for a fabulous trunk show/lecture entitled “Quilts & Their Stories,” by our very own immensely talented Iris Frank. Joy-Lily is a silk painter, fabric dyer, fabric printer and quilt maker. She is inspired by the natural world: shells, flowers, and leaves offer endless choices of colors and forms to celebrate. She believes we are all born artists and that some of us may have had our creativity stifled at an early age. 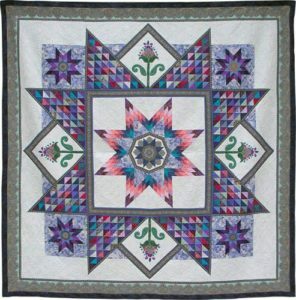 Joy-Lily will share her quilts and quilt journey with us in her lecture at our June meeting.